chicken nuggets | what is clara eating today? toast the bread and pulse in blender to make bread crumbs. cut the chicken to small pieces. lightly season with salt and pepper. 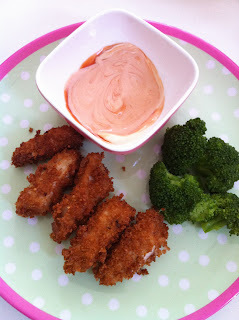 dip each chicken piece into mayo , then roll them in bread crumbs. heat the oil in medium-low heat. fry the breaded chicken pieces for about 2 minutes or until golden brown.